SpaceX Cargo Craft Fails To Dock With Space Station, Will Try Again : The Two-Way The private spaceflight company launched its Falcon 9 rocket on Sunday, only to have the rocket's cargo capsule encounter an error in its navigation system on Wednesday during a docking attempt. This is what failed to happen on Wednesday morning. In this image from April 17, 2015, a robotic arm on the International Space Station grasps a SpaceX Dragon cargo ship during docking. Early Wednesday morning, a space capsule carrying 5,500 pounds of cargo approached the International Space Station. The SpaceX Dragon cargo ship was scheduled to arrive at the station around 6 a.m. ET. If all went as planned, astronauts Thomas Pesquet of the European Space Agency and Shane Kimbrough of NASA would use a robotic arm on the station to reach out and grasp the ship, pulling it in and locking hatches with it. But that cosmic embrace was not to be. Around 3:25 a.m. ET, according to NASA TV, the navigation system on the unmanned Dragon cargo ship detected an error. A number was wrong in its GPS software. The ship automatically aborted its mission. It was about three-quarters of a mile away from the space station. The docking has been rescheduled for Thursday morning. "It did exactly what it was designed to do, breaking out of a rendezvous approach when it saw an incorrect value," said NASA TV commentator Rob Navias. Dragon is in good health and will make another rendezvous attempt with the @Space_Station Thursday morning. "This is an easily correctable issue," he explained during a live NASA TV stream of the docking attempt. "Dragon itself is in excellent shape." 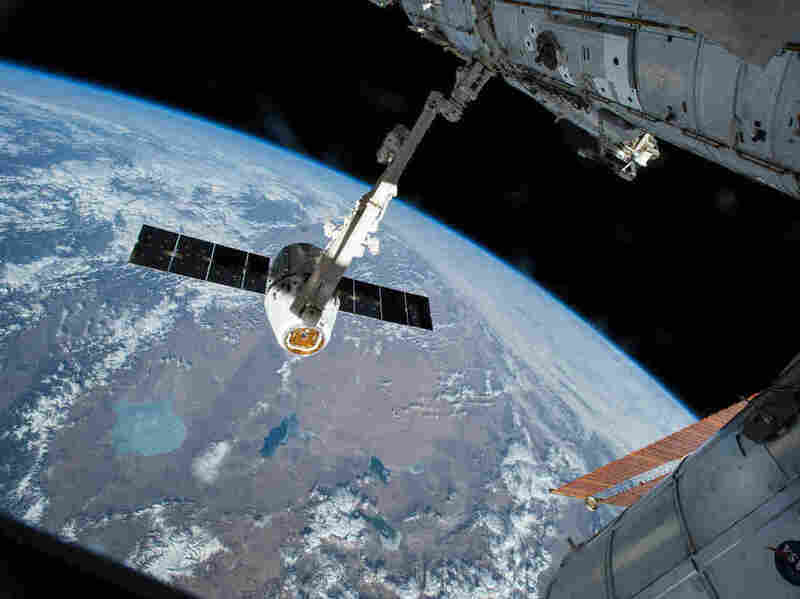 The new schedule means Dragon will arrive at the International Space Station the day before a Russian resupply rocket, which launched early Wednesday and is set to arrive at the ISS early Friday morning. As The Two-Way reported, today's is not the first delay for the SpaceX Dragon. The cargo ship was supposed to launch Saturday, but that was scrubbed just 13 seconds before liftoff because of an anomaly discovered in the rocket's steering system. "On Sunday, however, the launch went smoothly," NPR's Colin Dwyer reported. "Not only did SpaceX's Falcon 9 rocket lift off without a hitch, its first stage also returned to land right back on a platform on Earth. Shortly afterward, the Dragon spacecraft it was carrying detached as planned from the rocket." As The Wall Street Journal has reported, mistakes and setbacks in its rocket business have become an increasing concern for the commercial spaceflight company, in part because its founder Elon Musk has publicly announced that the company will build a system to colonize Mars. "Internal financial documents reviewed by The Wall Street Journal and interviews with former SpaceX employees depict robust growth in new rocket-launch contracts and a thin bottom line that is vulnerable when things go awry. They also show the company putting steep revenue expectations on a nascent satellite-internet business it hopes will eventually dwarf the rocket division and help finance its goal of manned missions to Mars." In addition to stuff humans use to live in space, the cargo craft is carrying science experiments. "One experiment will use the microgravity environment to grow stem cells that are of sufficient quality and quantity to use in the treatment of patients who have suffered a stroke," a NASA press release read. The mission will also aid in recording "key climate observations and data records."